During the last 20 years many European education systems have seen profound changes in the way they are governed. This also applies to the school systems of German-speaking countries which until then had been characterized by a long period of stability. Both political rhetoric and actual changes have rightly attracted increased attention of educational researchers, resulting in a growing body of work on the ‘governance’ of schooling. There is no such word as ‘governance’ in the German language. Nevertheless, a type of studies called ‘Governance Studies’, ‘Governance Research’ or ‘Governance Perspective’ has recently evolved in German-speaking social sciences. This article aims to make accessible this strand of research which has not yet been extensively published in languages other than German. Further, it intends to explore its links and relationships to other European research approaches. 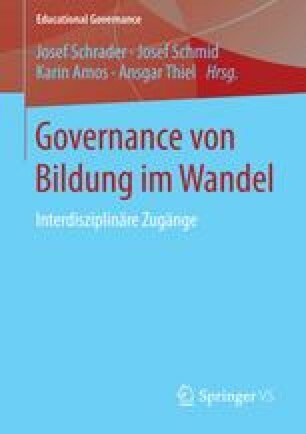 First, the article explains in what way the concept of ‘governance’ has been defined in German educational research. The second section discusses some of its methodological aspirations. In the third part, some examples of empirical research on changing educational governances are discussed in order to give an idea of how this research approach currently unfolds. Der Beitrag wurde ursprünglich als keynote lecture bei der European Conference on Educational Research im September 2009 in Wien gehalten und anschließend 2010 im European Educational Research Journal 9 (2), 147–158, veröffentlicht, dessen Herausgeber/inne/n wir für die Genehmigung zum Abdruck herzlich danken. Der hier wiedergegebene Text folgt der Erstveröffentlichung; einige Literaturhinweise wurden aktualisiert. Eurydice (2008): Levels of Autonomy and Responsibilities of Teachers in Europe. Brussels: European Commission. http://eacea.ec.europa.eu/ressources/eurydice/pdf/094EN/094EN_011_TOF.pdf. Accessed: 3 December 2008.